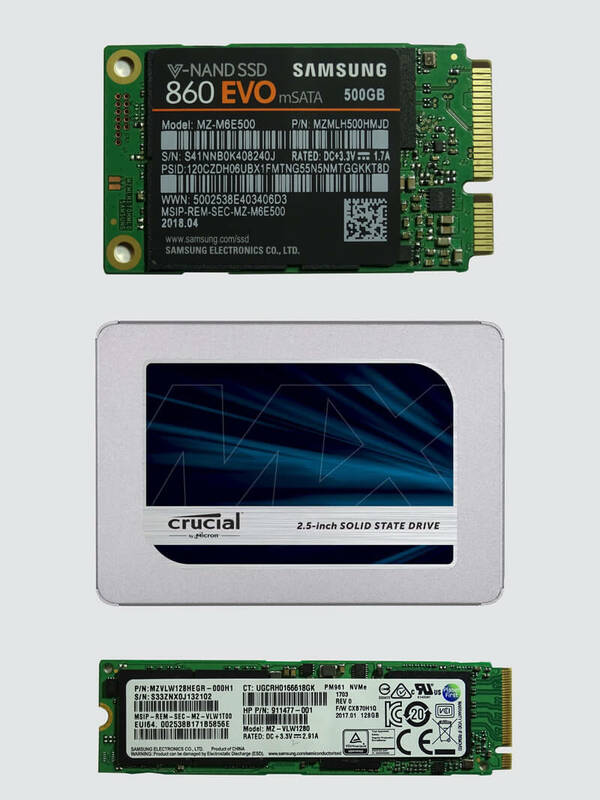 A Solid State Drive (SSD) uses similar technology to a USB flash drive (NAND memory) to store files and applications on your computer system, but unlike a traditional hard drive an SSD has no moving parts. This results in much faster read/write speeds and less noise and heat. They also use far less power than a traditional drive which results in longer battery life for your laptop computer. Because of how the information is stored on the drive and it can be accessed almost immediately, SSDs do not require defragmenting and will not get slower as the drive ages. Technology Information is stored on non-volatile memory. No moving parts Information is stored magnetically on an aluminium platter which rotates (usually) at 5,400rpm or 7,200 rpm. Performance Lower latency and faster read / write times (typically 10 times faster than standard hard drives) Higher latency and slower read /write times. Power Consumption No motors or moving parts results in lower power consumption (typically 2 - 3 watts). This results in longer battery life for laptops. Higher power consumption due to having to continually spin the platter(s) and move read / write heads to access data (typically 6 - 7 watts). Heat & Noise No moving parts so operates silently and produces very little heat. More noise caused by the moving parts and a little more heat is also produced. Physical shock / vibration tolerance Not as susceptible to vibration or physical shock. In a traditional HD the read / write head floats on a cushion of air just a few microns above the platter. Physical shock can cause the read / write head to crash into the platter causing loss of data and possible physical damage to the drive. Magnetic Fields Data is not effected by magnetism / magnetic fields that can be generated from electrical devices. Data can be wiped if the disk is subjected to strong magnetic fields. Defragmentation. Defragmentation is not necessary. Disk needs to be periodically fragmented or performance can be severely degraded. Cost SSDs are more expensive than traditional hard drives but the above advantages often make the extra price worthwhile. Cost per Gigabyte is considerably lower than SSDs. We can fit an SSD into almost any computer system whether it is a desktop PC or laptop and whether you are using a Windows system or MAC. We can supply a range of different sizes of SSD, typically from 120 GB to 2 TB - the most common size we fit is 250 GB. Cost for installation will depend upon how easily / quickly the drive can be fitted and whether you want your existing drive to be cloned or would prefer a clean installation of your operating system. The hard drive on most desktop computers can easily be accessed but it can vary quite a bit for laptops - sometimes there is an access panel to remove the existing hard drive on laptops but often a complete disassembly is required. If you choose to clone your existing drive, the time taken will obviously depend upon the size of the drive and how full it is. Typically, we can fit an SSD and clone your original system in about three hours. If necessary, we can leave you a free loan laptop whilst your system is being upgraded. Contact us for prices or to discuss your specific requirements.